Here are some more unusual and creative ways to wrap gifts. Wrapping with scarves is a popular method, and there are some very complex wrapping designs if you wish to explore them. The Japanese art of Furoshiki (a type of traditional Japanese wrapping cloth) will provide you with many techniques for wrapping objects of various shapes and sizes with scarves. Fortunately, there are some simple methods that will result in a beautiful looking gift. The first easy technique is a scarf-rolling wrap. Place the scarf with the design side down, and your gift in the middle and on the edge of one side. Roll over one turn, keeping the material tight on the item with the edge tucked in. Keep rolling until you get to the end of the scarf. Gather the ends and tie them with ribbons, rope, or twine. The second easy method involves tying diagonal ends. Place the scarf with the design side down, and your gift in the middle. 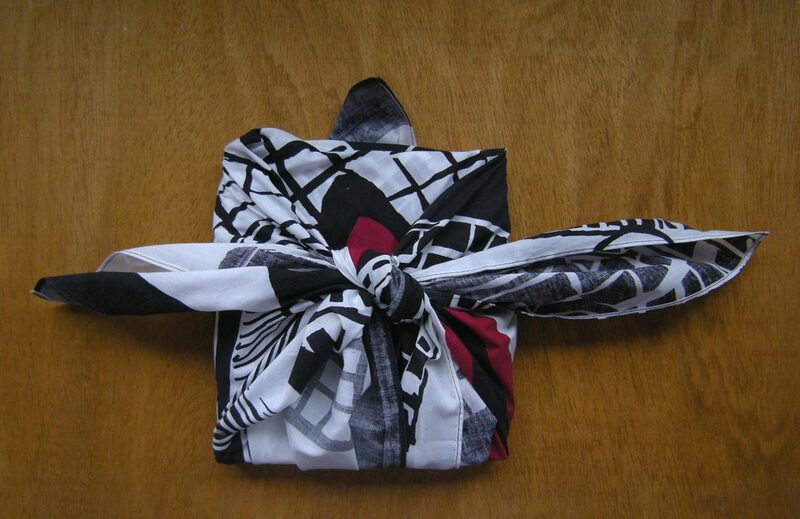 Take the scarf’s diagonal corners and tie them in a knot across the top of the gift in the middle. Take the remaining diagonal corners and do the same. The loose ends act as a lovely bow. This technique can be used on almost any gift shape. Jars are a fun way to give presents. Mason jars are a favorite choice, and come in different sizes, but any jar will do. Although food is a popular gift to place in jars, there are many other items that will also fit (e.g. art supplies, skin care products, jewellery, USB drives). You can line the inside of the jar with tissue paper to hide the contents if you wish, or you can cover the whole jar. Wrap it in a couple of layers of tissue paper, and tape it as any normal gift. Then tie and knot a colorful piece of ribbon around the center of the jar. Or wrap it in a linen dish towel, tying the gathered ends at the top with twine or ribbon. Wrap a gift in a clay flower pot for the plant lover in your family. Clay pots come in various shapes and sizes. You can use the drainage dish to cover the pot and hide the gift. Secure this “lid” with ribbon or a strip of fabric. Consider decorating the outside of the pot with paint or ceramic markers. If no drainage dish is available, wrap the pot in a piece of fabric, and use ribbon, twine, or elastic to tie the ends at the top. Another way to personalize your gift giving is to wrap the gift in something reflecting the recipient’s main interest or hobby. For example, if the person loves to cook, place the gift in a cooking pot, canister, or whatever item is appropriate to the gift size. For gardeners, try wrapping in a watering can, or sun hat. Your gift recipients will appreciate how well you know them. You don’t always have to use traditional bows as gift toppers. Toppers can include other items, such as homemade gingerbread cookies, pine cones or boughs, photos, scene paintings, dried fruit, paper animals, bells, beads, and other craft store items. There’s no shortage of topper ideas for both crafty and non-crafty gift wrappers. Keep your appliances in top running order for the holiday season. Call C&W Appliance Service at (855) 358-1496 or (214) 358-1496 for the very best in appliance repair and maintenance.